To millions of young readers in the 1990s, the covers of Goosebumps books promised stories of gooey green slime, monsters, and boys and girls in big shirts and Converse sneakers who had been subjected to freaky transformations or sent to the wrong summer camp. But what lie between these covers was mostly pap, cranked out by R.L. Stine at an average of a book of month (a pace that would make Georges Simenon sweat), with the same addicting formula of sloppy plotting, bad parenting, twists, and cliffhangers. Their protagonists, always 12 years old, rank as some of the dimmest and jumpiest in all of children’s literature; they mistake brooms, pets, and younger siblings for ghouls and tentacular horrors with a regularity that makes one question Stine’s grasp of the human sensorium, or at least wonder what witness testimony at a trial in his world would sound like. The clamorous big-screen Goosebumps reimagined Stine (who seems to have a decent sense of humor about himself) as a pompous wordsmith (Jack Black, hamming it up in his loudest Mid-Atlantic accent) whose most familiar creations escape the pages of his original manuscripts—killer lawn gnomes, the Abominable Snowman Of Pasadena, et al., with the ventriloquist’s dummy Slappy (Black again) as the ringleader and evil author alter ego. The result felt like a theme-park ride, but it made enough money to warrant a sequel. 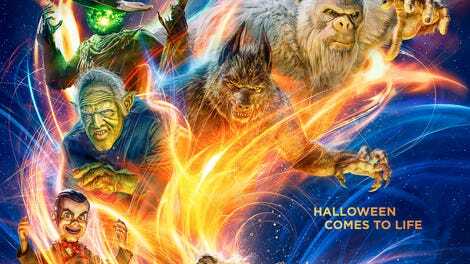 Though the new Goosebumps 2: Haunted Halloween gets closer to the spirit of Stine’s bestselling books, it also shares their reliance on formula, recreating the first movie’s monster mash with fewer self-referential gags. The small-town backdrop this time around is fictional Wardenclyffe, New York, the principal landmark of which is a mushroom-shaped tower built by Nikola Tesla. (The real-life inspiration and namesake is Tesla’s long-demolished Wardenclyffe station on Long Island.) It’s almost Halloween in the Quinn household. Single mom Kathy (Wendi McLendon-Covey) is getting ready to work an extra-long shift at the nursing home; college-bound Sarah (Madison Iseman) is agonizing over her Columbia admission essay (the subject is “overcoming fear”) and her feelings for the cute neighbor who, in teen-sitcom fashion, periodically climbs into her second-story bedroom window; and middle-schooler Sonny (It’s Jeremy Ray Taylor) has been roped by his best friend, Sam (Caleel Harris), into clearing junk from a dilapidated house when he should be finishing his diorama of the Tesla tower for science class. The house turns out to be Stine’s childhood home. There, the boys happen upon one of his magical Goosebumps texts—a manuscript for his unfinished first novel, which once again unleashes Slappy into the real world. (Was there always a Slappy? Has he forever haunted his dreams?) At first, the dummy plays the part of the kids’ wish-granting new friend, using his telekinetic powers to pants a bully (Stranger Things’ Peyton Wich) and finish Sonny’s homework. But a giggling, sinister sentient puppet that can control things with its mind should raise a number of red flags, and before long, Slappy is using his ill-defined powers to bring the Halloween decorations and costumes of Wardenclyffe to life, unleashing a Lovecraftian dimension of our most homogenized, kid-friendly frights on the unsuspecting residents of the town. Rubber masks tumble out of store aisles and grow full-size bodies, and jack-o’-lanterns terrorize trick-or-treaters; there’s a full-sized headless horseman to deal with, too, and a giant spider made of balloons. It seems the people of Wardenclyffe don’t cut any corners when it comes to Halloween, and one can’t help but wonder what a sick live-action cartoon genius like Joe Dante might have done with Haunted Halloween’s rioting, Gremlins-indebted holiday corn. To his credit, director Ari Sandel (The Duff, Vince Vaughn’s Wild West Comedy Show) does manage to pull off one memorable sequence, which pits Sonny and Sam against a swarm of colorful gummy bears that lump together as they try to get revenge on the humans who have gobbled their kind by the handful. But though Sandel relies less on exasperating, rubbery digital effects than Rob Letterman, the DreamWorks Animation vet who helmed the original, his direction of the monsters and mayhem is never more than workmanlike, racing joylessly through a shaky plot that barely holds attention. Stine’s books became a publishing phenomenon by offering scary-story tropes to readers who weren’t ready to be scared. 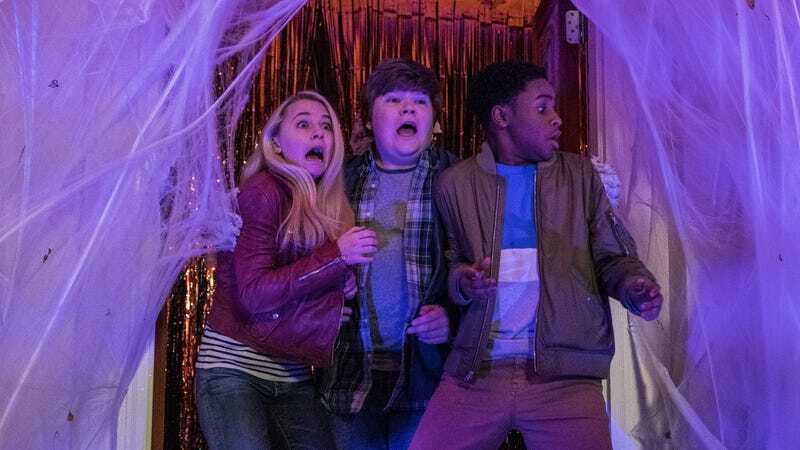 Following in their footsteps with less success, Haunted Halloween seems to be aimed at audiences who don’t want to be engaged. How did R.L. Stine create Goosebumps?